For this project, you will use jQuery to build a custom application for interactively selecting 24-bit colors. Below is a screenshot of my UI. The left column is purely output: a rectangle whose background color changes as the inputs are manipulated, a hexadecimal representation of that color, an RGB triple using base ten numbers, and an HSL triple using degrees and percentages. 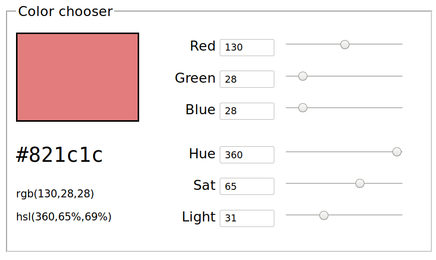 Here is a short video demonstration (no audio) of the color chooser in action. Notice how when one of the RGB fields is changed, most of the HSL fields also change, and vice-versa.